Legislation that would authorize the use of twin 33-foot trailers nationwide would decrease safety and damage freight infrastructure, the Mississippi Transportation Commission recently told a federal policymaker. The commission, which consists of three elected members who oversee the state’s transportation resources, also opposes modifications to vehicle weight limitations along interstate highways. “The limited data available showed that heavier trucks have higher crash rates and that longer trucks take 22-feet longer to stop, causing considerable bridge damage,” the commission wrote in a Aug. 28 letter to Rep. Steven Palazzo (R-Miss.). The commission went on to explain that the U.S. Department of Transportation concluded in a recent report there was insufficient data to determine larger trucks would operate safer than trucks under current weight restrictions. Senators recently advanced fiscal 2018 transportation funding legislation that directs the secretary of transportation to finalize a research plan on size and weight rules for commercial trucks within a year of the bill’s enactment. According to the report accompanying the legislation, the plan also should include research on truck configurations. Trucks are limited to 80,000 pounds nationwide. The commission has a staunch supporter in Sen. Roger Wicker (R-Miss. ), who has consistently opposed efforts on Capitol Hill to authorize the broad use of twin 33-foot trailers. 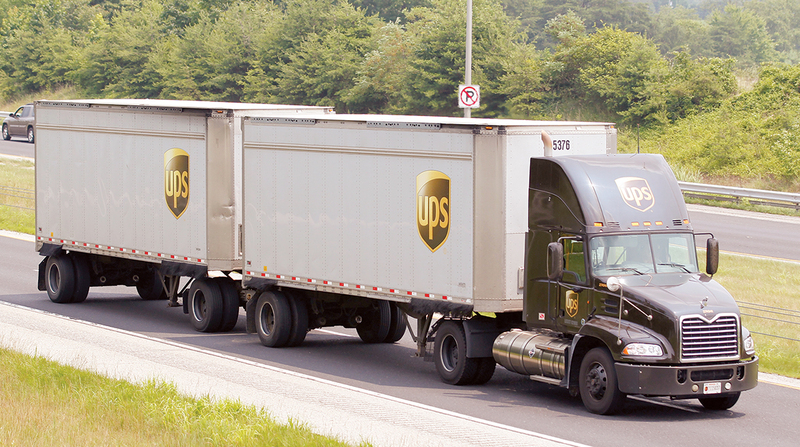 Its argument, however, fails to connect with Americans for Modern Transportation, a group that includes, UPS Inc. FedEx Corp., and Amazon.com Inc. The companies are urging Republican funding leaders to green-light the use of twin 33-foot trailers. “The ability for twin 33-foot trailers to navigate through intersections and interchanges is comparable to a 48-foot single trailer truck, making road design modifications unnecessary,” Americans for Modern Transportation wrote on June 29 to Rep. Mario Diaz-Balart (R-Fla.), chairman of the Transportation, Housing and Urban Development, and Related Agencies Appropriations Subcommittee. “It will improve utilization of existing highway infrastructure in the face of significant increases in congestion, reductions in capacity and a well-documented truck driver shortage and most importantly will improve safety for all those on our nation’s highways,” they added. UPS ranks No. 1 and FedEx is No. 2 on the Transport Topics Top 100 list of the largest for-hire carriers in North America.